Having finally seen a mountain laurel flowering, I can understand how it would be one of your favorites. I had to do a double take, as I was pretty sure they do not grow in Texas. Mountain Laurel is my home state of Pennsylvania’s flower. I can see why Pennsylvania would make this its state flower. I would, too, if I were Pennsylvania. (Can a person be a state?) Although we drove through parts of Pennsylvania on our way to and from Nova Scotia,the only place we consciously saw mountain laurel was Massachusetts. just now, I found the species in a part of Louisiana separated from the eastern border of Texas by just one county. Who knows if the plant will eventually spread westward into eastern Texas? I rarely see Laurel while driving in PA, but there are lots of wild rhododendron along the edges of the forests. Then hooray for wild rhododendrons! Now let’s hope you increase your MLQ (mountain laurel quotient). I just noticed it’s the state flower of Connecticut, too. 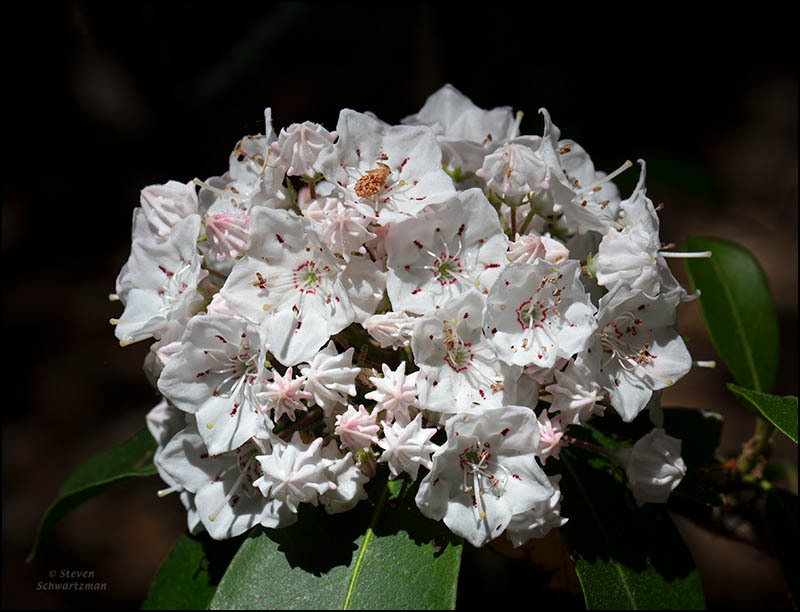 Maybe Connecticut and Pennsylvania can influence neighboring New York to change its state flower from the rose, which isn’t native in New York, to mountain laurel, which is. Yes, surely it grows in the in between state. Well, whatever they are and whatever family they belong to: they look great! 🙂 Some of ours here, unfortunately, are plagued by some kind of insect pests. Spraying with an insecticide helps, but for a few weeks only, and I don’t want to repeatedly use that stuff. In fact, I hate it even once. When you say “ours here” are you referring to the Texas mountain laurel? We inherited a small one of those in our yard 14 years ago when we moved in. For whatever reason, it never grew much, never flowered, and last year finally died. I understand why you’re averse to repeatedly putting insecticide on your plants. As for a great Sunday, I see we’re in for a great deal of heat: you’re supposed to hit 103° today, and we in Austin 106°. Yes, it’s Texas Mountain Laurel. Some of them are doing fine, and not much affected by these bugs – if at all – and some are really in a bad shape. I have no idea why the difference. We can wonder the same thing about the different reactions of people exposed to the same stimulus. I agree, but it still seems strange, especially when these trees stand next to each other. I often think scientists should assign new names as it becomes clear that the old classifications were wrong, but it might cause too much confusion and resistance. Actually scientists have been assigning new names, and those changes do sometimes cause confusion. The latest one I became aware of (thanks to shoreacres) for a wildflower that grows in Austin is that the basket-flower got changed from Centaurea americana to Plectocephalus americanus. A few years ago, all the species in the genus Gaura got moved to Oenothera, and in a few cases the species name of a Gaura had to be changed too because it was already in use for an Oenothera. I also know of some reclassifications, esp. with regard to some bird species, and it is not easy to call something by a new name when one is long-used to another. We are all creatures of habit! So we can say that in modern ornithology some creatures are no longer creatures of habit. Gorgeous, Steve. Reminds me of Rhododendron growing up in NJ. We had an enormous one in our yard. Same family, I think? I just confirmed what you said, that Rhododendron is also in the heath family. I also learned that the genus includes over a thousand species. I seem to remember that, similar to your experience in New Jersey, plenty of people on Long Island planted rhododendrons too, though I believe they were species from Asia. One nice thing about being back in the east on this recent trip is that I saw some native American rhododendrons in Pennsylvania. You’re welcome. I should add that I also saw a native rhododendron species at Garden in the Woods in Massachusetts. In fact I’ll be showing it this coming week. And one of my favorite songs as a child was “Go Tell Aunt Rhody.” I just listened to it again, and laughed as much as I did all those years ago. It was a little grim, but not nearly so grim as some of the Grimm’s fairy tales we were raised on. Ah, Burl Ives. Don’t think I ever heard that song. And yes, the real Grimm’s fairy tales were grimmer than the sanitized versions we got over here. Her choice of flowers may have been influenced by the fact that the rhododendron had been West Virginia’s state flower since 1903. What a great name for an interior decorator: Draper. We spent the second night of our trip in Roanoke, Virginia, which I see is only about 30 miles from the Greenbrier Hotel. The name has significance for me because of West Virginia’s Greenbrier River, which I photographed in 1975 or ’76 when I drove up from Charlotte (NC) for the day just so I could set foot in West Viriginia for the first time. Speaking of Dorothy Draper, I once did a brief and informal study to see if people with matching first and last initials (like me) are represented in the population more often than you’d expect by chance. By scanning entries in a phone book I confirmed my hunch that they are, and by a factor too large to be by chance. And speaking of rhododendrons, we saw native ones on the grounds of Frank Lloyd Wright’s “Fallingwater” in southwest Pennsylvania. Had the Frank Lloyd Wright Bachman-Wilson house been installed at Crystal Bridges when you visited? I took time to tour it. To paraphrase the old saying, it was a nice place to visit, but I wouldn’t want to live in it. I do think I’ll write about it, though; it has an interesting history. There’s a concise history of the Greenbrier itself here. I’ve always been intrigued by the cold war bunker they built underneath the thing to house Congress in the event of nuclear attack. Yes, it was a recently added attraction when we visited it. As you say, it might not have been the greatest place to live, whatever its pedigree. I knew about the secret bunker at the Greenbrier Hotel but had forgotten about it till your reminder. We could call it the emergency egress for the Congress. Kalmia latifolia was something that we tried unsuccessfully to introduce into the nursery industry a few years ago. It did reasonably well for us, but did not last long in the cans when it did not sell. We had only a few white stock plants. They were the least popular. I happened to like it because many of my colleagues are from Pennsylvania and that region. I grew Sophora secundiflora in my own garden, but it was killed a long time ago. It is a long story. Automatic Gardener in the first comment mentioned that Kalmia latifolia is the state flower of Pennsylvania, which implies that people up there like it. I certainly enjoyed seeing the various flowering specimens of it at Garden in the Woods. From what I see online, the natural color is white with a rose tint, as shown in today’s photograph. I wonder why that would be the least popular color in the nursery trade. People from Pennsylvania often want to garden with plants that exemplify gardening in California, such as palms and such. Some liked to add a few familiar features, such as arborvitaes, rhododendrons, azaleas, spruces and such. Mountain laurel was unpopular most likely because not many knew it was even available, or that it grew here. However, those who wanted it REALLY wanted it, and were very pleased to find it. The one cultivar we had that was white, was plain white, without the blush. Like rhododendrons, mountain laurel provides do many weird colors that only mountain laurel can provide, such as maroon, magenta pink and brick red. Although white is my favorite color, the other colors were just too impressive to ignore. Where mountain laurel is more popular, white might be more popular. To my mind, it’s a shame when people in a place like Pennsylvania want to garden with palm trees from California—especially since the kinds of palms in Beverly Hills aren’t even native to California. As an outsider, I have trouble understanding why people in areas where mountain laurel grows naturally wouldn’t want it in their yards. But then there are many things about human behavior I don’t understand. Oh, they might want mountain laurel in Pennsylvania. I really do not know. It is just not popular with many in California, either because those from Pennsylvania do not know it lives here, or because they want the Californian plant material. I do happen to find it annoying that we want what is not suited to our climate, and when we get what is suited to our climate, we give it so much water that rots and dies. (Then we brag about our brown lawns that prove we are using less water.) If I lived in Pennsylvania, I would want to grow a windmill palm, but that is all. I would not want a palm to become a prominent feature of the landscape. I happen to like palms. I was particularly impressed with those on Bedford Drive in Beverly Hills. They do not look like that now of course. The California fan palm, although not common in urban landscapes, does happen to be native to regions not too far away from Beverly Hills. It just does not do so well in irrigated landscapes. It is right at home in Palm Springs though. You might find this to be amusing. I remember that post of yours from two weeks ago, and commenting that we have a small species of native palm right here in Austin. Beautiful photo, Steve! I have fond memories of eastern mountain laurel. The area where I grew up in Connecticut had much of it in the woods. I remember the flowers as being somewhat sticky at the base. Your Texas mountain laurel looks quite diferent, and also strikingly beautiful. This may be my favorite photograph from Garden in the Woods, given the way the bright (and faintly pink) white glows out of the darkness. As soon as I saw these bushes flowering in several places there, I was captivated. On the USDA map, the species is marked for Long Island, too, where I grew up, so who knows if I saw some when I was a child? I barely paid attention to such things back then. Yes, the Texas mountain laurel is completely unrelated and doesn’t even look like the Kalmia. It’s hard to understand why anybody would have applied the name mountain laurel to it. Of course it’s hard to understand why people do a lot of the things they do, right? I’m completely smitten with that little red line encircling the stamens, and what appear to be matching anthers. The pink blush is so pretty — the star-shaped buds look like cake decorations, or meringues made with a pastry tube. If it would grow here, I’d plant it in a minute. I wonder if the connection between our mountain laurel and this eastern one might be the bay laurel tree (Laurus nobilis): at least, as far as common names are concerned. The leaves of both plants resemble those of the bay laurel. My hunch is that, as people moved inland from the coast, the similarity in the leaves’ appearance led to the naming. They weren’t on the bays anymore, but in relatively hilly country, so: “mountain laurel.” That’s my hypothesis, anyway. I’ll bet you’re right about how mountain laurel came by its popular name. Smitten with etymology as I am, I’m also pleased to learn the origin of Loreto. That word reminds me of the ethnically Italian neighbors in the house next door to the one I grew up in on Long Island. There were two children, and the girl was named Loretta. Here’s a delight from the one-thing-leads-to-another department. Your description of the mountain laurel’s way of dispensing pollen sent me on a hunt for one of our Texas natives that has an equally unusual system. I couldn’t find it, but I did bump into an article about the ways that various mistletoes use stored mechanical energy in much the same way. It’s good to see you’re a member of the One-Thing-Leads-to-Another Society. I have it on good authority that it’s a lifetime membership. And how unlikely that the reference you found was to a plant I photographed in Nova Scotia and Maine but hadn’t even known existed till then. In the link provided for the Kalmia latifolia the flower is described as showy. I think you have shown that very well in the sense that the flower is striking and stylish. Definitely showy. I’d be showing it to you several times a year if it grew in my part of the world, but unfortunately it’s a no-show here. Lovely image of a lovely plant, Steve. Growing up in the northeast, I saw them a lot, and always loved to peer into those delicate, intricate cups. A brilliant design, right? I wish I’d paid attention to that “brilliant design” when I was also growing up in New York. This was my compensatory portrait 4 or even 5 decades later.